The vast majority of people save the bulk of their retirement funds in qualified retirement accounts (401ks, 403bs, etc.) and IRAs. Through regular saving and long-term growth of the investments inside these accounts, a typical account holder hopes to develop some type of an income stream during their retirement years. According to the US Census Bureau, the average retirement age is 63. Of course, this is just the average and we see many more people working much longer in their careers. A family member of mine just visited a doctor who is still working well into his 90s! Noting that, it is obvious that everyone’s “retirement plan” looks very unique. What is not unique is the fact that we are seeing more and more clients living well past 90 and 100. Living longer can potentially complicate your financial and tax planning. One often ignored, yet powerful, planning area is proactively addressing Required Minimum Distributions (RMDs). If planned for properly, efficient planning can result in massive tax savings and additional asset accumulation for you and your beneficiaries. 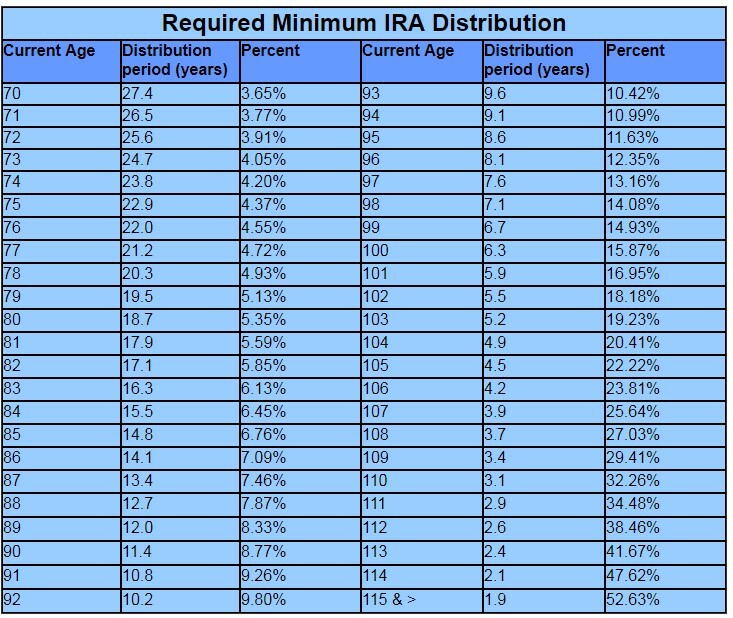 Generally, you are required to take an annual amount from your IRAs and qualified retirement accounts once you turn 70 ½. I have included the IRS Uniform Lifetime Table (not the only table used but one that applies to most people) below as both a reference but also to display the accelerating nature of RMDs. Notice at age 70, the required percentage to withdraw is 3.65%. From a planning standpoint, this is a reasonable withdrawal rate in most plans we construct. However, notice at age 80 and age 90 where the required percentage is up to 5.35% and 8.77% respectively. With people living longer than ever, these higher percentages are becoming a more common reality. In recent years, we have noticed this becoming an unforeseen issue to some clients. The issue arises when the required amount to withdraw far exceeds the amount of income the client otherwise needs. Ordinary income taxes are paid on all distributions from traditional retirement plans. This income is added to the front of your 1040 tax return along with any other income you and your household generate in that year. For people who have aggressively saved for retirement, they could find themselves in a much higher tax bracket than they originally expected. The primary reason this has turned into an issue is due to the proliferation of the 401k plan. In 1978, a bill was passed allowing employees to defer some of their income and not pay tax on the amount deferred (currently up to 18k per year for those under 50, 24k for those over 50). As well, many companies match some or all of the employee’s deferral. These funds stay invested and are eventually fully taxed as the investor withdraws the funds. The rationale behind this was simple: defer when you are working and your tax bracket is high and then withdraw once you retire and your bracket is much lower. For many people, this works and the automated nature of this strategy pays off. But for some people, they are finding the opposite to be true: they are finding themselves paying taxes at a rate similar or even higher than when they were working. I will use a rather extreme, although real, example to illustrate this point. Let’s say we have a 30-year-old doctor who makes $180,000 and plans to work to age 70. She defers the $18,000 allowed and receives an equivalent match during her entire career. If she attains an average return of 8% annually during her career, her retirement account balance will be $9,725,412 when she retires at age 70. Based on current RMD schedules, her required distribution at age 70 will be just under $355,000 putting her in a much higher bracket than her working years. If she was able to maintain her balance at age 80, her required withdrawal would be $520k and at age 90, a staggering sum of $852k! This also does not account for higher contribution after age 50 and any adjustment to the tax code that might allow higher contributions in the future. Again, many people would love to have this problem but I want to display what the impact of long-term DEFERRED savings can be. Below I have listed a few strategies we have used with clients to combat this issue. Each has to be carefully considered as part of a comprehensive plan so please involve us when considering your options. 1) Use Roth accounts early and often! Roth IRAs and, since 2006, Roth 401ks are the best way to combat this problem. By paying your taxes BEFORE it is invested, all growth AND distributions are tax free. Fortunately, for higher income households, Roth 401ks have no income limits so this presents an amazing opportunity to defer funds that will never be taxed again. 2) Convert what you can! We have made recommendations to a number of clients to convert some or all of their retirement accounts to Roth accounts. This strategy does require paying ordinary income taxes on converted funds (which can be a very difficult pill to swallow!) but the goal is to pay taxes on a smaller number now versus when it is withdrawn. For example, if a client converts 100k in a retirement account and that account grows to 200k over time, the 200k is now fully tax free at withdrawal. We also have a number of clients pursuing a systematic conversion schedule where they convert some each year to lessen the eventual tax they might owe. 3) Keep working past age 70! If you are not at least a 5% owner in your employer, you can defer your RMDs by continuing to work. This only affects funds that are in your employer’s plan but many plans allow you to roll in outside accounts. In most cases, this prevents you from having to take your RMDs until you stop working. 4) For those over age 59 1/2, consider drawing some of your funds earlier! This has proven to be a worthwhile approach for many of our clients who previously planned to defer all withdrawals until RMD age. The traditional plan for most retirees was to spend down non-qualified accounts (taxable, in your name accounts) prior to drawing from retirement accounts. In some cases, this can be counter-productive because the retiree may be just adding to their eventual tax bill. 5) Save some additional funds outside of retirement accounts! Currently, most people pay 15% to 20% on ordinary dividends and long-term capital gains. There is a case to be made that one should plan to save in this type of an account as well as there is no required time for withdrawal and large distributions will not push you to a higher tax bracket. 6) Consider your estate plan as part of your strategy! Estate planning is one of the most often ignored issues as it relates to retirement plans. Currently, spouses can roll inherited funds into their own accounts while non-spousal beneficiaries can roll into an inherited IRA. This allows the beneficiary to spread the distributions, in most cases, over their lifetime. By passing your assets via a Roth account, your beneficiaries will receive those distributions tax free. We could go on for pages describing a variety of methods to address current or eventual RMD planning. The most important point to take from this commentary is to not assume what you are currently doing is the best approach. By thinking long-term and creatively, we have helped countless numbers of clients develop a plan that is specific and beneficial to the client and their family.